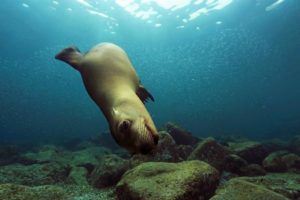 Diving in Cabo San Lucas Marine Park offers short boat trips to beautiful coral encrusted rocky reefs teeming with fish, invertebrates and seasonal marine mammals like sea lions and whales. Cabo Trek offer year round private scuba trips to these sites. The marine protected area was established in 1973 and cover almost 90% of the bay. Most of the premier dive sites are located along the stretch of coast running to Lands End. The best thing about these sites – being protected areas for the last 37 years they have experienced a great increase in fish and invertebrate populations. Our favorite dive spots are Lands End and Pelican Rock. Trip time from the harbor to the Bay dive sites is a very nice and comfortable 10 minutes, perfect for those who tend to suffer from sea-sickness. Our boats are stable and comfortable. 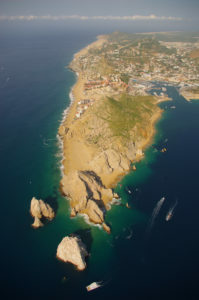 During the surface intervals we can tour the area, visiting the Pacific side of the peninsula to examine the unique geographical structures that have made Cabo San Lucas famous – like the world renowned Cabo Arch. You can also visit the sea lion colony at Lands End and have a walk on Lovers and Divorce Beaches. During the months of December through March we are often lucky to enjoy the spectacular show put on by the Whales that visit the Los Cabos region. 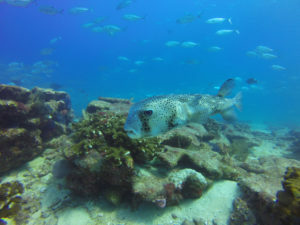 Diving in Cabo San Lucas Bay is a great way to spend a half day getting the know the amazing biodiversity that has made the Sea of Cortez famous. 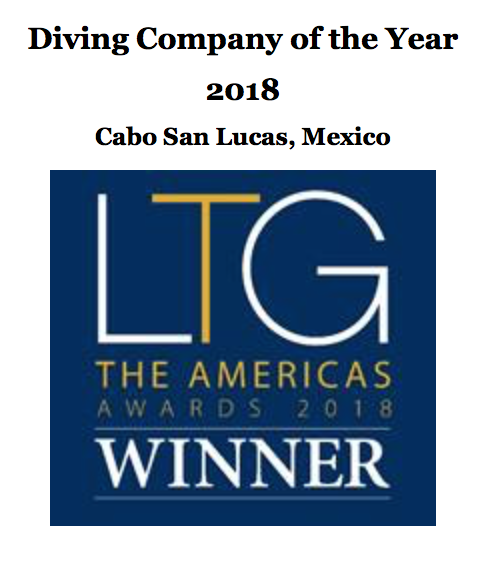 Cabo Trek offers you a unique valet service with private scuba trips, snorkel & Whale Watching Tours all led by our top rated PADI Instructor Team in Los Cabos, Mexico. Dive tours in the Cabo San Lucas Marine Park would be incomplete without a scuba tour that makes up the reefs and walls of Pelican Rock. At Cabo Trek this is one of our favorite sites as the area seems to be a magnet for marine life, especially magnificent macro. A small rocky islet that breaks the surface near to Lovers Beach. Depth on the beach side is 25 feet, along the back, the wall drops to beyond recreational diving limits. 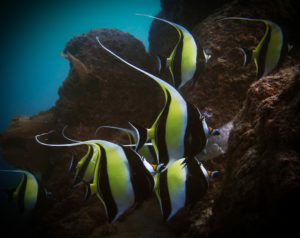 This is a great site for underwater photo and video. The rocky walls are covered with multi-hued corals , sponge and algae. Inside the coral are Frogfish, Puffers, Hawkfish, Gobies and Blennies. 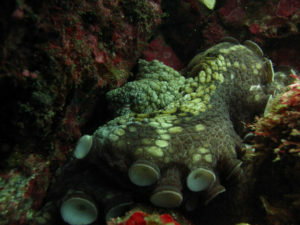 Invertebrates like Urchins, Sea Stars, Sea Cucumbers, Nudibranchs and Octopus are common here. Scorpionfish and Coronet fish are also common, drawn by the feeding opportunity. Seasonally there are often huge schools of Sardines, Snappers and Goatfish, with Grouper and Jacks stalking them along the back wall of Pelican Rock. Diving with Cabo Trek at Lands End is an inspiring experience and a different one each time. Cabo San Lucas is the meeting point of 3 oceanic currents, which translates to a huge biomass of fish that passes through and has made this area famous for sports fishing. 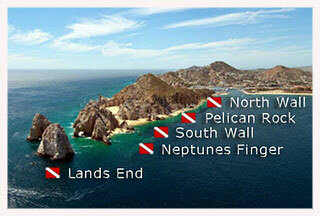 Lands End is our favorite dive site in the Cabo San Lucas Marine Park. Lands End or The Point is at the southern most point of the Baja Peninsula. This is next to the seasonal home of a colony of California Sea Lions who are quite used to divers. Depths at the sandy base of the rocky monoliths are at most 70 feet. This site is subject to conditions, as currents and surge can be strong. 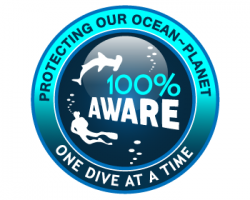 While we can book your scuba tour to include diving at Lands End, please be aware conditions can change by the hour and we always prioritize safety above all. During the tour we often encounter large schools of snapper, sardines and butterflyfish in the water column surrounding ‘The Iceberg’. This is a large rocky pinnacle that just breaks the surface south of Lands End. 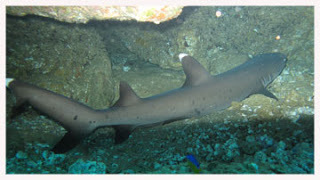 Large predatory fish like grouper, machete Barracuda and occasionally white tip sharks stalk the schools here. 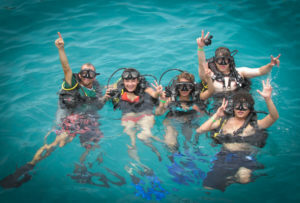 This is the best site for seeing different species of wrasse, nudibranch, parrotfish, angels and large green moray eels. Don’t be surprised when a cormorant (diving birds) swims by at 60 feet, hunting between the rocks. 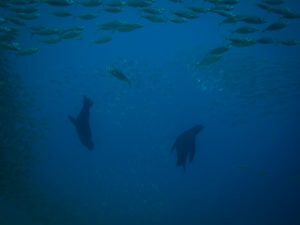 Diving Lands End is always exciting, on great days huge schools of mobula rays block out the sun, but almost always we do our safety stop visited by the sea lions next to the colony rock. 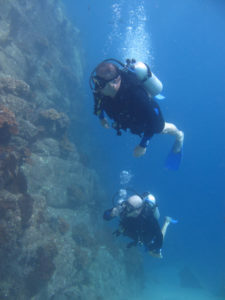 Come and enjoy a multilevel dive with Cabo Trek along the steep drop off of Neptune’s Finger. The rocky reef extends a skinny crag skyward, likend to be Neptune pointing up to the sky. Unique in the bay of Cabo San Lucas, this dive site is best for divers who enjoy deeper tours. Neptunes Finger begins as a continuation of the deep site known as South Wall that runs from Pelican Rock to Neptune’s Finger. A series of rocky reefs interspaced by sand chutes are capped off by a shallow rocky sharp pinnacle. This is a good site for a deep dive. 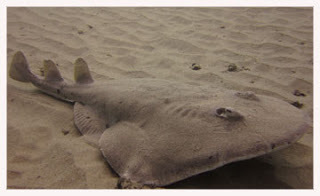 Electric Rays, Guitarfish and Stingrays may be found in the sand at the top of the wall. 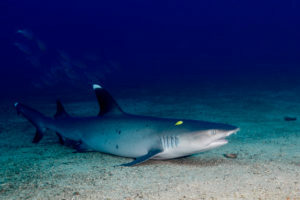 When the visibility is good, schools of Eagle, Cow Nose and Mobula Rays may be seen in the blue, and numbers of Barracuda may pass by. Exploring the rocky reefs that border the sand chutes you can expect to find Burrfish, Balloon and Puffer fish as well. 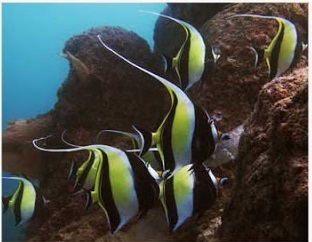 Schools of Goatfish, Butterfly fish and Wrasse surround the reef structures. During the safety stop you can explore the base of Neptunes craggy finger looking for Sea Horses, Blennies and Eels. Come and explore the deep wall in the Bay of Cabo San Lucas Marine Park with Cabo Trek, a dive site seldom visited by typical Los Cabos operators. A private scuba trip means you can chose these special reefs to explore. Is a deep wall that starts at 90 feet and drops into the dark of the bay, beyond 1200 feet. Beginning south of Pelican Rock we typically drift towards Neptune’s Finger following the crest of the wall between 80 and 100 feet. Larger pristine coral formations, big schools of fish, large groupers and chance encounters with pelagics are some of the best life to see along South Wall. slopes steeply down from 25 feet, boulders and sand channels point into the abyss. 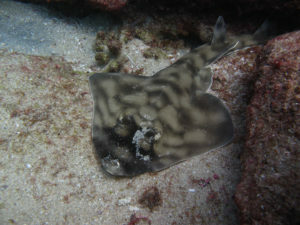 The site is very protected from waves and is our ‘fall back’ dive site when conditions are rough. 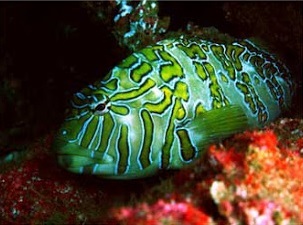 There are schools of Butterfly, Angel, Damsel, Wrasse and Goat fish followed by Grouper, Jacks and Coronet fish. Small coral formations dot the rocks that hide Eels, Puffer and Scorpion fish This is a good site for those who like to take their time peering into crevices and exploring. For those who have no fear of disorientation i recommend a “jump” in the blue and if our braveness is adequately rewarded we will come across a big school of Mobula Mantas.